Newmarket, NH; October 24, 2016 - With the onslaught of advice for staying warm this winter about to arrive (we're working on a special blog post just for you die-hards who love prepping your homes for winter), we thought we'd share a few of the recipes and traditions that fill our bellies and warm our hearts during the holiday season… or anytime we need a sweet treat. From the crew at Proulx Oil & Propane, we hope you enjoy! In a large bowl, beat cake mix, water, oil and eggs with electric mixer on low speed for 30 seconds, then on medium speed for two minutes. Reserve 12 of the peanut butter cup candies for garnish. Coarsely chop remaining candies; stir into batter. Divide batter evenly among muffin cups. Bake for 18 minutes or until a toothpick inserted in center comes out clean. Cool 10 minutes; remove from pans to cooling racks. Cool completely. In medium bowl, beat powdered sugar, peanut butter, butter and vanilla with electric mixer on medium speed until smooth. Add whipping cream; beat until frosting is smooth and spreadable. Frost cupcakes. 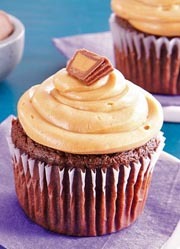 Cut reserved peanut butter cup candies in half; garnish each cupcake with one half candy. Brioche bread is ideal for this recipe. You can bake this right away, but it tastes best if refrigerated overnight first. Let us know how your recipes turned out, and stay tuned for the savory version of this article in the coming weeks!